Ramona's Voices: The Worst Mass Shooting in U.S History Happened Today. Hello, NRA. Are you There? The Worst Mass Shooting in U.S History Happened Today. Hello, NRA. Are you There? Today we woke up to news of another mass shooting, this time in a gay nightclub in Orlando, Florida. The facts about it are sketchy but it looks like a hate crime, an obvious act of terrorism. The horrific news, coming in bits and spurts, is that 50 people are dead and 54 have been injured. It's being classified as the worst mass shooting in U.S history. The shooter's name is Omar Saddiqui Mateen, an American on the FBI watch list thought to be inspired by Isis. The motive, it appears, is a murderous hatred of gays, but the ease of owning military-style assault weapons gave him an opportunity to act on it. It was about as carte blanche as it gets. Details are sketchy; it's early yet, but it's a fact that a single shooter murdered 50 people and injured as many more. I'm not shocked--mass shootings have become regular occurrences--I'm outraged. I'm sick of living in a country known for our violence, our casual acceptance of assault weapons--big guns manufactured for military use but romanticized and propagandized by the NRA and their spawn, American-style militias, as proof of our God-given, constitutional liberties. I'll wait to see how the NRA reacts to this. If they don't condemn the wide-spread ownership and unregulated use of guns that are nothing more than killing machines, I want to know how they're any different from any other terrorist organization. No excuses. No outcries about the right to own guns, about liberties, about how the fault lies in the killer's motives and not in the guns he used. He found a way to get those guns, to get that ammunition and nobody stopped him. Nobody. December 17, 2012 - After every major gun-inflicted tragedy we're told by the pro-everything-that-shoots bunch that it's too soon to be talking about gun control. 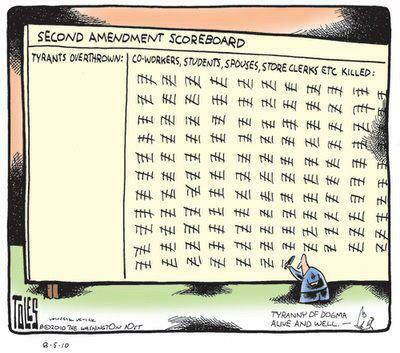 We hear again that guns don't kill people, it's the people misusing the guns who kill people. We hear that they could just as well be using knives or garrotes or box cutters or poison or 3,000 pound vehicles. On Friday we awoke to another unspeakable mass murder, this time involving our precious children, and I have to believe it is, at last, sadly, the turning point we've been waiting for. We'll be having the conversation we should have kept going before, and this time something will get done. We will not stop until we get control over our fascination with owning military-type weapons. On Friday, December 14, 2012 a 20-year-old man killed his mother, took guns from her collection, along with hundreds of rounds of ammunition, drove to Sandy Hook Elementary School and deliberately shot it up, killing six adults and 20 children, most of them First Graders. He took three guns into that school and methodically shot and killed 20 (yes, twenty) small children. He used weapons more suited to combat than to hunting or self-defense and he was able to do that because in the United States of America private citizens are allowed--even encouraged--to own combat weapons. It's a solid fact that the United States--either through outright permission or through cowardice in the face of bullying opposition--has declared guns to be free agents, not subject to any but the most basic, toothless laws regarding safety or security or limitations. How could that be? It could be because so many people, including politicians who are supposed to be up on those things, want to believe that one single clause in our constitution--the grievously misunderstood Second Amendment--says so. 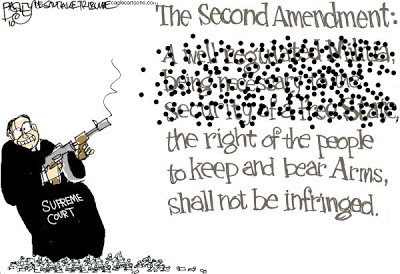 There is nothing in the Second Amendment about an individual's right to keep guns. Not unless that individual becomes a well-regulated state Militia of One. There is nothing in the constitution that gives copyright rights to the National Rifle Association (NRA), allowing them to drop important words that tend to get in the way of their mad, skewed interpretation. ("A well-regulated Militia" sticks in their craw, undermining their entire premise, so it's out). We want to believe our constitution is not for sale, but, in fact, the NRA has found a way to own an entire amendment. It's now impossible to think of the Second Amendment without making a connection to the National Rifle Association. They use it to convince the gullible that the government is coming to take their guns and the only way to stop them is to invoke their "constitutionally guaranteed citizens' right to bear arms." They've co-opted and corrupted a constitutional amendment and turned it against the very government that instituted it and implements it. (The original meaning, that is--having to do with giving the states the right to organize a militia--or, as we've come to know it, the National Guard). The fact is, even if the Second Amendment were abolished, guns would not be banned in this country. Gun ownership is a long-established right, almost universally accepted and woven so tightly into our fabric there's no danger of a Great Unraveling. It won't happen. Where we differ--often mightily--is in what kinds of guns should be legal for private citizens to own and how they should be regulated. Whenever a fresh gun-induced tragedy strikes, the argument starts all over again. Those on my side pick up the fight for smaller calibers and stricter gun control and the "assault weapons are guns, too" crowd digs in and buys more firepower, just to prove they can. It's now a multi-billion dollar industry, and the NRA, thanks to the politicians they own (along with--let's not forget--the Second Amendment), will go on daring us to try and do something about it. They have no fear, and why should they? They've never lost a battle yet. I say let's take that dare. Right now. Today. While the memory of 20 little first graders and the six adults who died trying to protect them is still so raw it's making our hearts bleed. In voices as loud as those gunshot booms resonating throughout the halls of the Sandy Hook Elementary School, we can demand the end to the sales of military weapons and the ammunition that goes with them. We can force the licensing of firearms, demand oversight at gun shows, and find a way to follow the paper trail for every gun owned in this country. 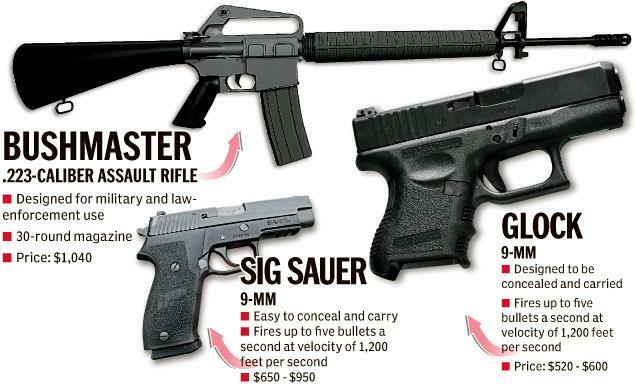 We don't need to ban all guns in order to get the assault weapons craze under control. The collectors want those big guns because they want them and they think that's reason enough to make it a right to own them. It's not. The NRA has been pretty silent the last few days. In fact, they're downright invisible. They took down their Facebook page and they're not answering their Twitter-phone. If they're regrouping, trying to come up with some good reason why assault weapons shouldn't be banned, I can save them some trouble: There is no good reason. Wanting to own one because its big and bad and exciting is not a good reason. 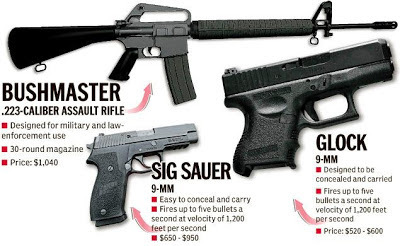 Wanting to own one because you think the government is going rogue and you might need it to protect yourself and those around you is insanity. In case you missed the latest craziness coming out of my state, Michigan, I'm ashamed to report that on the day before the mass shooting in Newtown, our legislature passed a bill allowing guns in classrooms. The legislation is the largest rewrite of Michigan’s concealed weapon law since lawmakers made hard-to-obtain permits much easier for adults to receive beginning July 2001. Applications exploded. There were 351,599 permit holders as of Dec. 1, one for every 20 adults. Most of the attention on the new bill has focused on provisions allowing hidden handguns in places where they are now forbidden, such as schools, university dorms and classrooms, and sporting stadiums. The time for talking is over. Now we act. We get it done. HEY, AMERICA! Don’t just sit there! DO something!